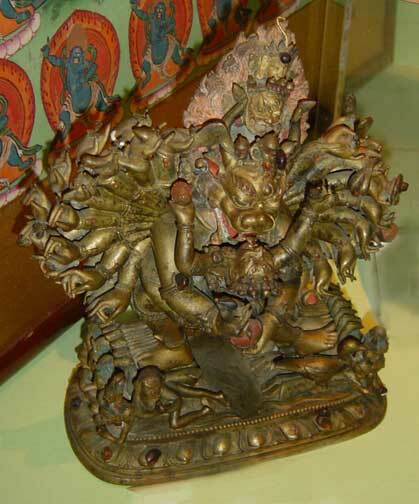 YAMANTAKA or VAJRABHAIRAVA with his consort; Tibetan; gilded and polychromed bronze, embellished with stones and coral; 18th C; H 7" - 7.5"
A ferocious manifestation of the Bodhisattva MANJUSRI, Yamantaka is the "Conqueror of Death" and the deity who surmounts the obstacles of egotism and selfishness. The central of his 9 heads is a water buffalo's; his 16 legs tread on Hindu deities (who represent ignorance), animals, birds and demons; and his approx. 36 arms hold different weapons. When Yamantaka is depicted with his consort, the two symbolize the indivisible union of wisdom and compassion, the practice of which leads to the attainment of nirvana.